I put Leo on the bus this morning, and Seymour and I drove Mali to school. Iz and I leave for Ghana in less than an hour. I think Mali will be fine -- she'll have Daddy, she'll have Grandma -- but I am worried about Leo, because we're tight, we two. So I've done as much as I can to guarantee I'll "be" there for him even while I'm away. Making the books was easy-peasy, because with Kid in Story you can take and insert photos from within each photo page (though you could also use stored iPad Photos, if you like). Even a thirty-page book only took about 20 minutes to make. Even better, I could then upload the customized books to the cloud storage service DropBox, and keep copies of them there -- so I have backups if Leo decides to delete the resident versions (deleting and/or duplicating media is a favorite iPad pastime of his). And with the free Kid in Story Reader, I can even import and Leo can read the stories on my iPhone, even though the primary app is iPad-only. These custom digital favorite books make Leo so happy. He uses them to keep himself calm when we're at medical appointments (there have been a lot of those lately). He can page through them at whatever pace he likes. And there's no danger of him loving the digital books to pieces, which he has done on occasion with their board-and-paper versions. 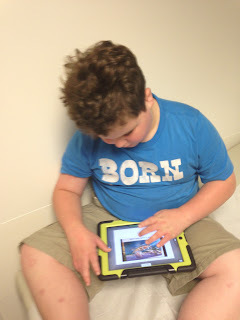 The ability to make Leo these custom digital favorite books is as thrilling to me as when Oceanhouse Media came out with the ability for users to add their own voiceovers to their Dr. Seuss OmBook iPad apps -- I believe that ability to control repeated readings contributed to Leo's performance yesterday, in which he read/recited the paper version of Dr. Seuss's I Can Read With My Eyes Shut to me in its entirety (!!). It is so great to have so many options to support his reading. While I hope there will be sufficient wifi for me to FaceTime with Leo (and Mali, and Seymour, and my Mom) while Iz & I are in Africa, there's no guarantee of that. But I can guarantee that Leo will hear my voice while I'm away. I really hope that will help make it less hard for him that I'm away. Iz and I are going to Ghana tomorrow. We'll be there for two weeks. And it almost didn't happen, which is why I've not talked about it much. 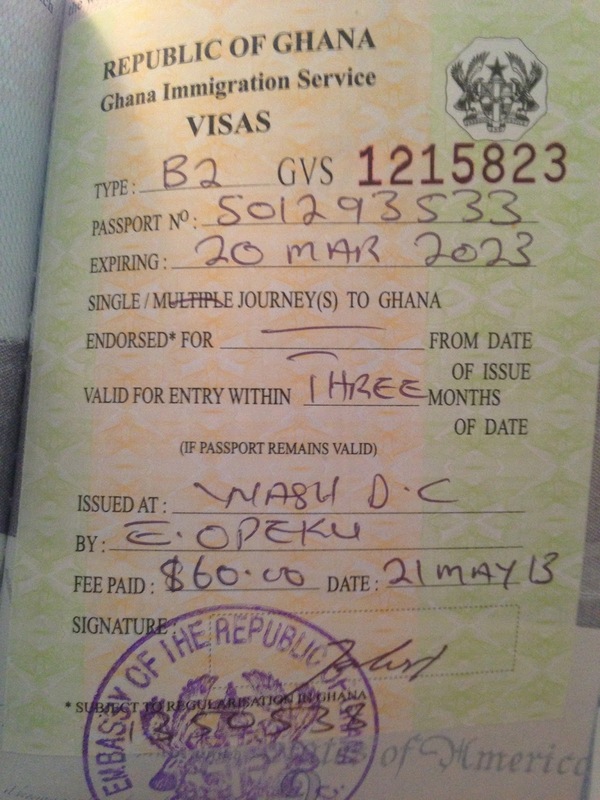 I figured I'd write about the trip as soon as our Visas arrived (Ghana requires US travelers to send our passports to the Ghanaian Embassy in Washington DC, and have the visas affixed therein). And because I tend to over-prepare with travel logistics, I sent our passports in five weeks ahead of our departure rather than the required minimum of two weeks. About three weeks before our departure date, the passports hadn't come back, and I started getting nervous. As in not-sleeping nervous. 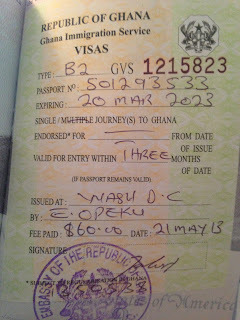 Even though the Embassy of Ghana website says that one month is a reasonable window. Then, two weeks before our ETD, I got a phone call from the Embassy, saying that I'd sent in the wrong type of return envelopes and needed to send a new one (to their credit, they have since updated their website with return envelope specifics). My dear sister-in-law, who lives in the DC area, waited in line 90 minutes to deliver the new envelope personally. And five days later, we received it. Containing only Iz's visa and passport, not mine. One week before our scheduled departure. I was incapacitated with hysterics for 30 minutes. Once I regained the ability to speak and make decisions, I immediately overnighted a new return envelope to the Embassy. I also left several voice mails, asking what the hiccup might have been. I never heard back, so all I could do was carry on as though we were going, buying gifts for Ghanaian friends, arranging care and specifics during my absence (my mom is coming to hang out with Seymour and the two little kids, Seymour is hosting a hackathon and needs extra babysitting, etc.). And -- for the first time in my life -- using pharmaceuticals to sleep, otherwise it didn't happen. The only information I had was my twin USPS Express Mail confirmation numbers -- for the outgoing envelope, and the return envelope. So I was able to confirm the Embassy's receipt of the envelopes. But from Tuesday through Friday -- before a Monday departure -- I could only compulsively check USPS.com's tracking service for the return envelope. I thought the envelope might get sent out Thursday, since the Embassy's consulate, which handles the visas, is closed on Fridays. But there was no tracking information on Thursday night. And there was no information Friday morning, mid-day, or afternoon. I kept checking anyhow, even as I confirmed that -- should I need to spend the hundreds of dollars necessary to change our flight, should that even be possible as there just aren't that many flights to Accra -- I'd need to do so by 8 AM Monday morning. Before the post office opens. Which means that unless my passport arrived Saturday (yesterday), I'd need to change my flight. And then ... magically, at 6 PM on Friday night, the tracking service said that the envelope had been processed through their DC facility. I stopped hyperventilating just a bit, unwilling to calm down entirely until the passport was back in my hand. I figured the relief of knowing everything would probably be OK would be enough to let me sleep, but -- nope, I was up at 3 AM on Saturday morning. Compulsively checking the tracker as the package arrived at our regional hub, and then our local hub just before 9 AM. The tracker did not provide any further information after early morning, so all I could do was watch the mailbox (not easy to do, if you've been to my house). It hadn't arrived by 1, when Mali's classmates came over for a pool party. Fortunately they were happy to play in the house first. And then I noticed that someone had parked too close to our mailbox, a scenario that usually results in our local carrier bypassing the box and taking the mail with him, and leaving a grumpy note with the mail the next delivery day. But just as I was freaking out anew, I saw the mail van go by -- and ran out into the street to wait for him to drive back (we're on a long cul-de-sac). Five minutes later, at 2 PM, he came up the hill -- and handed me the envelope, which did indeed contain my passport and visa. Delivered at literally the very last possible moment. So, we're going. Yay! I think this will be a good trip. We're going for many reasons -- Iz just finished her freshman year of high school and so is only ours for two more summers after this, she still likes me most of the time, kids who have the opportunity to do so should see more of the world, I want some damn fufu, and I am a few beats beyond burned out. I need to be away for a bit. Seymour understands, I am grateful for that. I hope I come back refreshed. And I hope that the visa saga is the only seriously stressful part of our trip.